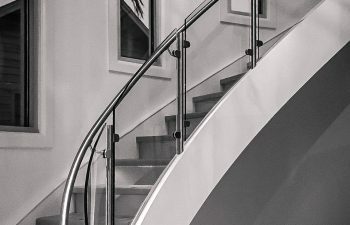 In our previous Turnkey Curved Stairs blog, we explored the benefits of our turnkey installation option for curved stairs. Did you know that our team’s extensive capabilities are available to customers across the nation? Based just outside of Atlanta, Georgia, our team has proudly designed and delivered turnkey curved stairs for destinations from coast to coast, including recent deliveries in Nashville, Tennessee, Miami, Florida, and San Francisco, California. This week, we continue our discussion of national curved stairs capabilities, featuring a unique staircase designed by our team for a luxury residence in the Sunshine State. Our team recently designed and constructed a unique, modern curved stair for a residence in Destin, Florida. Located on the Gulf of Mexico, Destin is a quickly growing community with many high-end, modern beach homes. Our creative design team worked collaboratively with the client to design a curved stair that would reflect the modern, open style of the space. A double-stacked curved stair, this project was designed and delivered through our turnkey approach, creating a perfect fit and finish for this unique coastal home. Featuring a sleek glass railing system and maple stair treads accented by glass risers, the system perfectly complements the beautiful chandeliers in the residence. With clean lines and a striking appeal from all angles, this stacked curved staircase is the epitome of contemporary curved stair design. Successful construction and installation of a curved stairs of this magnitude require outstanding skill and precision. Before constructing this staircase, our team performed professional measurements and studied architectural plans to ensure the perfect fit and curvature. With the design concept and spatial needs identified, our team then provided expert drawings and renderings to the client. Once the client approved all drawings, the stair was constructed within our Georgia facility. The modern handrail system was built and pre-fit to the staircase to ensure a perfect fit. Finally, the complete system was delivered to the Florida jobsite where it was installed by our team. Our turnkey approach leverages a robust project management system to streamline the design and delivery of even the most custom curved staircases. From Beverly Hills to Boston, our customers can expect a smooth process throughout all phases of construction. With advanced technology, industry-leading skill, and a deep knowledge of building codes and restrictions, our team is dedicated to ensuring quality and satisfaction for both local and long-distance customers. From the initial design phase to construction in our state-of-the-art facility and installation by our expert craftsmen, our team is dedicated to timely delivery and lasting quality in each project, no matter the distance. Visit our curved stairs product gallery for additional details and pictures on our exquisite projects. From inspiration to installation our team is committed to designing and building the highest quality custom staircases. Our reputation speaks for itself and client satisfaction is our highest priority. Contact us today to discuss your next curved stair project.